During the early morning General Thomas requested that Negley’s Fourteenth Corps division “rejoin” his command, even though it anchors the southern end of his line. His intention is to prolong the north end of his line from General King’s Regular Brigade across the Lafayette Road. The wisdom of this is debatable. He already has a double line along the Kelly Field, and could easily have withdrawn units, perhaps even an entire division, to do the job. Nevertheless, Rosecrans orders it done, and at this hour the division is on the road ready to move north. To the south, Wilder’s Lightning Brigade of mounted infantry withdraws from Viniard Field. 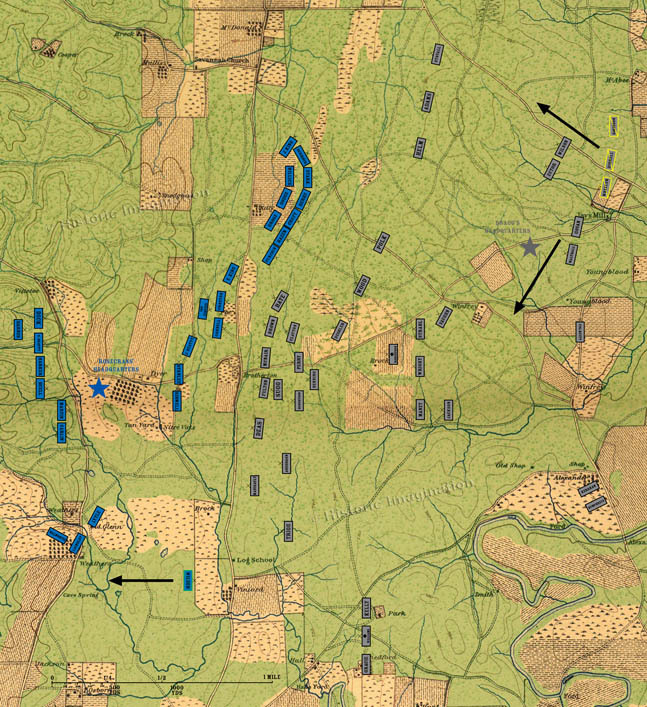 For the Confederates, Brigadier General Forrest’s command moves from its morning camps to a position guarding the right flank of Breckinridge’s Division. Liddell’s Division is ordered south to support Cheatham’s Division.